Most of us won't see Stephen Colbert's "Late Show" for another week, but several hundred people have already watched him quiz guests and try out material. These episodes aren't quite ready for television. They're test shows, designed to let Colbert work out any kinks before he finally ascends to the late-night throne once occupied by David Letterman. Some of the lucky audience members say Colbert has brought big changes to the Ed Sullivan Theater stage along with some remnants of his "Colbert Report." In interviews with CNNMoney, attendees gave an early glimpse into one of the most highly-anticipated TV premieres in recent memory. Susan Pane, a dog groomer who lives in Manhattan, attended the first test show last Thursday with her sister. She said it resembled an actual broadcast in many ways. Colbert interviewed a pair of guests -- former Pittsburgh Steelers coach Bill Cowher and former U.S. poet laureate Billy Collins -- and the house band, led by the jazz musician Jon Batiste, kept the crowd (and the host) grooving. Heading into Colbert's Sept. 8 premiere, the big question is who exactly will show up, given that he played a jingoistic, self-serving conservative pundit on Comedy Central for nearly a decade. 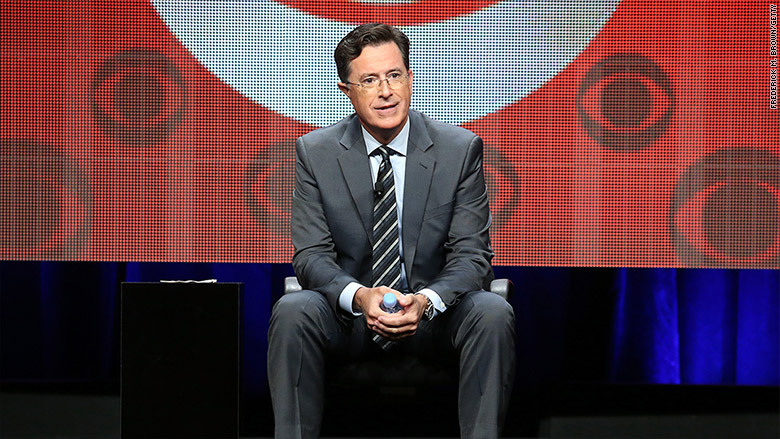 Colbert has said that he'll abandon the character when he takes the "Late Show" reins. And Pane said one of the bits at Thursday's test show played off this, with the host submitting to a lie detector test in an effort to answer the question: "Who is the real Stephen Colbert?" She said Colbert was "genuine" and that he didn't showcase the "goofy persona that he had on the 'Colbert Report.'" Pane noticed a few technical glitches -- "they're still working on things" -- but she raved about the episode. Pane, 58, said she was one of the oldest people in attendance, which speaks to one of the reasons CBS was so eager to poach Colbert. The network is counting on him to bring the young people who religiously watched the "Report" and made up what the comedian dubbed "The Colbert Nation." People like Scott Interante, 24, who attended a test show on Monday. Interante, a graduate student at Hunter College in Manhattan, noticed that the Captain America shield and book shelf that decorated Colbert's Comedy Central set have made the trip over to CBS. Interante said the two-level "Late Show" set is "beautiful," with a video screen that provides a cityscape backdrop, but also displays pre-packaged comedy segments. He said Colbert takes the stage through a garage door, lending the set what he described as a "mechanic shop aesthetic." Above the stage is a sign that reads: "The Late Show with." The absence of the host's name is deliberate, as the sign is positioned above where Colbert will stand each night. One of the pre-packaged bits during Monday's test show featured a reel of news clips poking fun at Hillary Clinton's evasive responses to questions about her email use at the State Department. "It definitely felt like an old Colbert thing," Interante said. The early bookings for "Late Show" suggest that Colbert won't be abandoning the political arena. Jeb Bush will appear on next week's debut episode. The following week, Colbert will welcome Democratic presidential candidate Bernie Sanders. During Monday's test show, Colbert interviewed Garry Trudeau, creator of the liberal comic strip "Doonesbury," who previously appeared on the "Report." Interante said that Colbert did "a standard late night thing," although with a notable cosmetic difference. Whereas Letterman's opening sequence featured nighttime images of New York, Colbert's shows the city drenched in sunlight. Pane and Interante both have sunny outlooks for Colbert's "Late Show." They praised the New Orleans-style house band, which moved about the crowd during both test shows. Like Paul Shaffer before him, Batiste figures to play more than just a musical role. The band leader participated in a rehearsed comedy bit with Colbert during Monday's show. More test shows are scheduled for the remainder of this week. Another Monday night attendee, Alastair Coote, said he came away impressed, tweeting afterward that "most of my fears about him going to a big network show seem unfounded." And Chelsea G. Summers, who attended last Thursday's, said Colbert "was delightful." Interante said Colbert fans won't be disappointed. "When they initially announced that Colbert is taking over I was excited, but also nervous because he seemed so reverent of the medium," he said. "I was afraid he was going to play it a little safe. After seeing the show, I'm definitely optimistic."